VeriCite DocumentationUser GuidesBrightspace User Guide LTI Content Item Integration - Instructor ArticlesHow do I edit a VeriCite LTI assignment? From the Assignments screen, locate the assignment you want to edit. Zoom: From the Assignments screen, locate the assignment you want to edit. If you would like to make a quick change to the title, due date, or point value of an assignment, you can do so from the Assignments listing page by clicking on the Edit icon next to any of those items. If you would like to view or modify all of the assignment details, including the assignment description, attachments, and report options, you will need to go to the assignment settings area. Zoom: Click on the assignment. From the Assignment Submissions page, select Settings. Zoom: From the Assignment Submissions page, select Settings. Zoom: Modify the assignment information. In the Report Options section, you may select the default settings for this assignment. By default, these options are all enabled. If you would like to turn off the Exclude Quotes option for this individual report, remove the check mark next to that option. Turning off this option will include all text in the matching index, regardless of whether or not students have quoted the text correctly. Note: The References or Bibliography section of a paper is always excluded from the matching, even if quotes are not excluded. If you would like to turn off the Exclude Self Plagiarism option for this individual report, remove the check mark next to that option. The default setting is Yes in order to avoid false positives. Excluding self plagiarism allows students to submit multiple copies (or drafts) of the same text within the same course without it being flagged as a match. Note: Student submissions of the same text in different courses will always be flagged as student paper matches. If you DO NOT want student submissions for this assignment to be added to your private institutional repository, remove the check mark next to the Store in Index option. 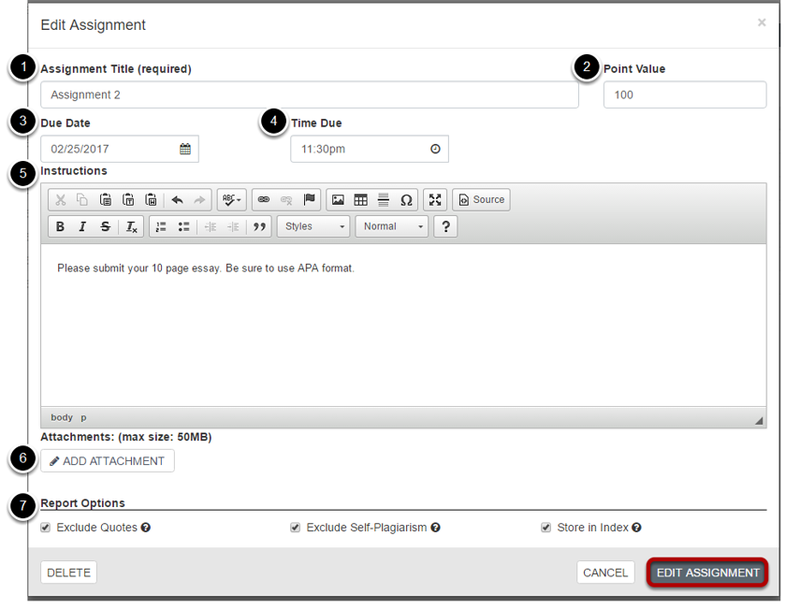 Then, click the Edit Assignment button at the bottom to save your assignment details. Prev: How do I manage role permissions in VeriCite LTI? Next: How do I filter the VeriCite LTI assignment list?